MassTech International’s tank, line and valve testing methodologies can be applied to road and rail tanker testing bringing the benefits of globally-recognized certification, an audit trail and third party analysis to an industry which has historically relied on technicians reading a dial and making manual records. Since testing may be carried out on a client’s own site, it is important that equipment is intrinsically safe. 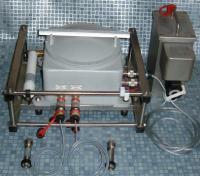 MassTech International’s engineers developed equipment specifically with such requirements in mind.